I was surprised by a large box in the mailbox today. I sign up for free stuff all the time so figured it was something I'd forgotten about. However the letter stated it was from Tide & being a fan of facebook & being one of the first 5000 signups for the give-a-way. Since I'm not a "facebooker" I didn't really know what was going on. 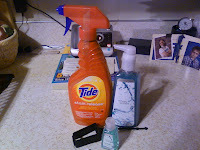 Retha calls a bit later & tells me she signed me up for the Tide Stain Release. What a nice mother-in-law I have! She also reminded me of the Bath & Body Works LUV CLUB we signed up for & today was the first give-a-way for it. A full size soap, pocket hand sanitizer & a holder for it (we got to pick what scent). All in all it was a great day for free stuff.